When it comes to great bar design there’s a variety of elements that work together to create a comfortable, entertaining space for both guests and employees. Not only should the bar fixtures be decorative and engaging, but they also have to be functional for bartenders and servers to work efficiently. Incorporating a smart layout or stylishly displaying the selection of liquor on LED-lit shelving can provide a hospitality environment that will have guests wanting to come back for more. With these best practices for bar design, the practical and decorative elements of your space will provide the best experience possible. For maximum productivity behind the bar, It’s ideal for bartenders to stick to the One Step Rule. The primary goal for the back bar area is that bartenders should be able to perform all of their main duties without taking more than one step. It all boils down to your employees working smoothly to run a successful bar. The placement of the sinks, draft taps, and the spatial relationship between seating and tables can all make or break your business. While wide aisles can be ideal for servers to run food or drinks, it can often make for a possibly uncomfortable and isolating experience for guests. In fact, tight aisles and seating arrangements don’t have to mean that your guests are squished together at the bar -- this option can actually create a sense of togetherness with the crowd and general “action” of the bar environment. 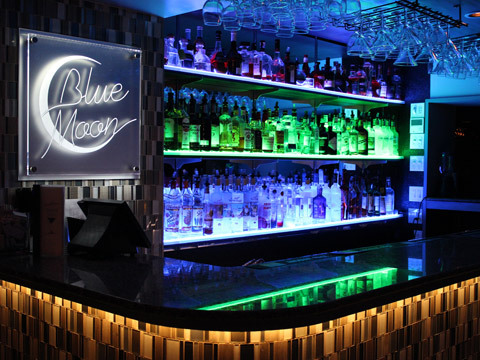 A great way to captivate customers and show off your wide selection of premium liquor is to use LED light shelves. Horizontal design is predicted to rise in popularity this year since spaces that utilize the length of a room are said to feel cozier and more accessible. Since people prefer to face illuminated walls, a few rows of acrylic shelving can create a central focal point in your bar that will be attractive to customers. The LED shelving selection from Armana Productions are suitable for nightclubs, lounges, hotels, and bars, and feature a sleek design with options to control the brightness and colors. Recent bar and restaurant design trends have featured floating shelving for the back bar and liquor display areas as opposed to outdated huge, clunky wooden pieces. When determining your bar’s shelving, keep in mind the functionality of the material. Wooden or glass shelves are classics but can require regular dusting and general upkeep. Instead, acrylic shelving has the effect of creating a light and airy space and has the benefit of being half as light as glass. In recent years, acrylic has become a highly sought out material for furniture and fixings due to its durability and low-maintenance. Designing a bar is complicated, so start by asking yourself two simple questions. Would I want to have a drink here? Would I want to work here? Whether you own a neighborhood pub with a few plasma screens or a high-end nightclub, your bar is where people will go to be relaxed, entertained or stimulated. It’s important to design an environment that makes your customers feel comfortable and also creates good workflow for staff.